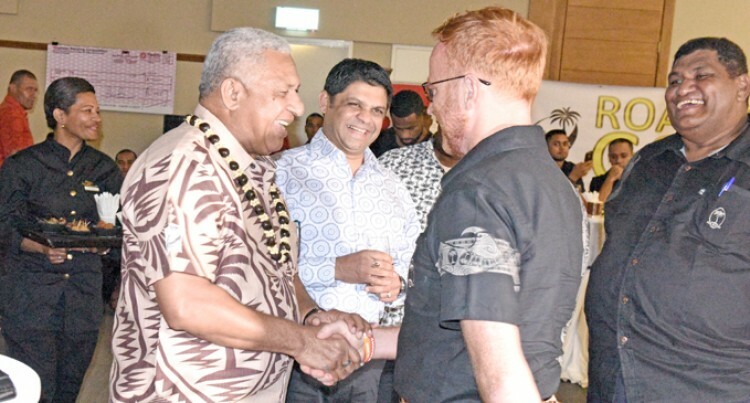 From left; Prime Minister and Fiji Rugby Union president Voreqe Bainimarama, Attorney-General, Aiyaz Sayed-Khaiyum, and coach Ben Ryan at the Grand Pacific Hotel on Saturday night. Prime Minister, Voreqe Bainimarama and Attorney General Aiyaz Sayed-Khaiyum congratulate Team Fiji men’s 7s rugby coach Ben Ryan after the announcement of the men’s and women’s teams for the Rio Olympic Games. The team return to camp at the Uprising Beach Resort today and depart for Santiago, Chile, via Auckland on July 26. The women depart this Saturday. The Rio Olympics is from for August 5-21.